Hardcover, 12 x 8.5 in. / 136 pgs / 95 color. 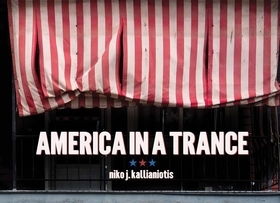 America in a Trance, the first monograph from Pennsylvania-based Greek photographer Niko J. Kallianiotis (born 1973), dives into the heart and soul of the Pennsylvania industrial regions, where small-town values still exist and small businesses once thrived under the sheltered wings of American industry. It was to this cradle of American industrialism that immigrants from Europe once crossed the Atlantic, in hopes of a better future. Some, like Kallianiotis, who has called this place home for about 20 years, still do. Those decades have taught him how beliefs from both sides of the fence in the current political climate have a direct effect in these towns. And yet Kallianiotis achieves a certain level of neutrality within the work, whether portraying Pennsylvania coal towns to the east, the shadows of looming steel stacks to the West, or every faded American dream in between. a deeply personal exploration of a once prosperous region of Pennsylvania now plagued by decay, depression and loss. FORMAT: Hbk, 12 x 8.5 in. / 136 pgs / 95 color.